Eugene Laverty leads his Aspar Ducati team-mate Yonny Hernandez at Phillip Island in Australia. Eugene Laverty finished in the points at Phillip Island but struggled during a race the MotoGP rider described as his “most difficult” of the season. The Aspar Ducati rider finished in 14th place behind team-mate Yonny Hernandez at the spectacular Australian circuit, where British rider Cal Crutchlow powered to the second premier class win of his career. 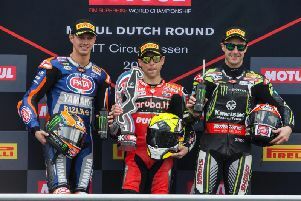 LCR Honda rider Crutchlow was gifted the lead of the race when newly crowned world champion Marc Marquez crashed out on the Repsol Honda on lap nine at Honda corner. Italian great Valentino Rossi, who scythed his way through from 15th place on the grid after the weekend’s practice and qualifying sessions were plagued by poor weather, briefly looked poised to threaten after moving into second on the Movistar Yamaha. However, Crutchlow put the hammer down and began to pull away, winning in the end by more than four seconds for his second victory this season, coming after the Coventry man won in the wet at Brno in the Czech Republic in August. Maverick Vinales finished third ahead of Ducati’s Andrea Dovizioso. Pol Espargaro (Monster Tech 3 Yamaha) and Jorge Lorenzo (Movistar Yamaha) were the first six. Two races remain this season at Sepang in Malaysia this weekend, with the season reaching a climax at Valencia in Spain on November 13.